What is #MatExp all about? #MatExp is all about maternity experience. The focus of it is to identify and share best practice in maternity services all over the country so every woman gets the care that is right for her needs, every time. #MatExp first began as an idea by Consultant Obstetrician Florence Wilcock as a patient experience ‘small pilot’ for NHS Change Day. Read more of Florence’s story. It has now flourished into a grassroots social campaign involving hundreds of people from all over the country, and from all walks of life. 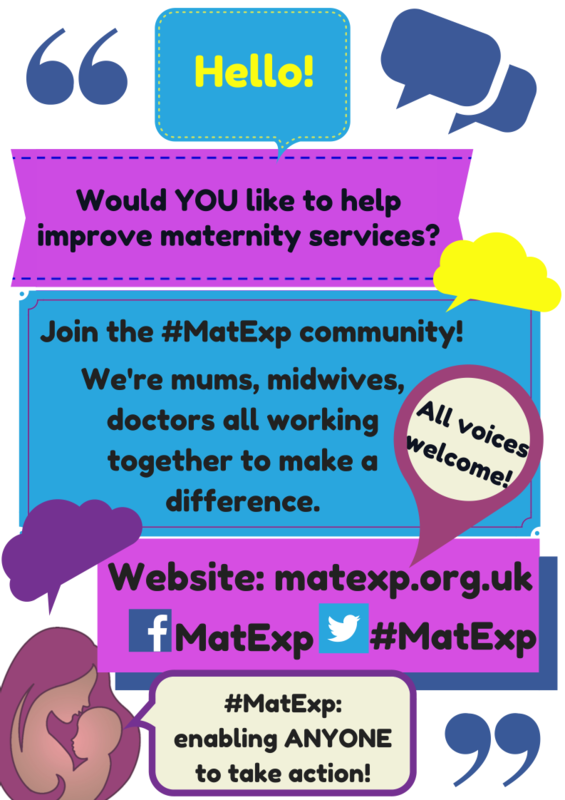 How can I get involved in #MatExp? 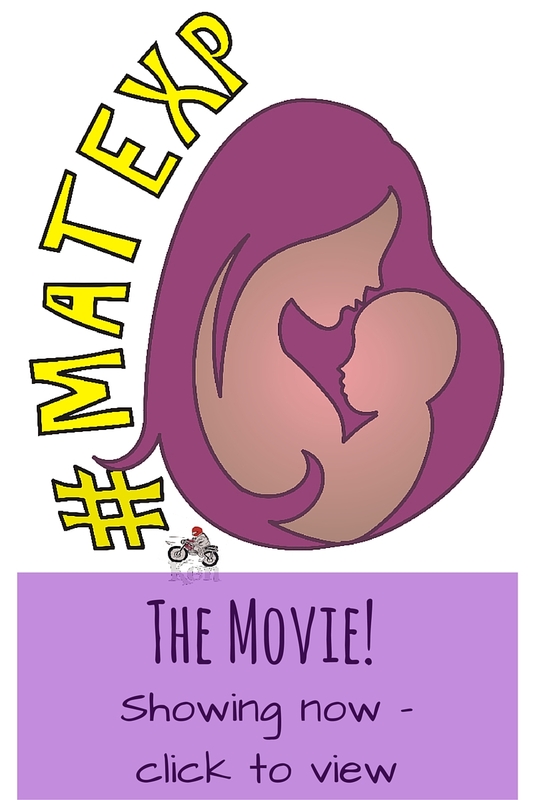 – If you are on Facebook, join the #MatExp group. – Get in touch with your local maternity provider to give them feedback about your experiences – good and bad! If they don’t know what patients think about the care they provide, they can’t do anything about it. The main thing to remember is that #MatExp is all about ACTION. We think SMART: Specific, Measurable, Achievable, Realistic, and Timescales. I don’t work in the NHS, and don’t really understand how it works. How can my contribution be valuable? People from all walks of life are involved in #MatExp: people who work for the NHS (in roles directly caring for people and in support roles), and people who don’t. No matter what you do for a living, your voice matters! Birth affects us all in some way, and remember – you are an expert in your own care. In fact, some of the best observations come from people outside of the NHS because they are able to see things with ‘fresh eyes’. Just take a look at discussions on social media to see what we mean. Is #MatExp just about clinical services? No – while looking at clinical services (how, where and why care is provided to women and their babies) are an important part of #MatExp, the more holistic side of care – how these services make mums and their families feel, are just as important. Kindness, empathy, and compassion are key to #MatExp. How does #MatExp connect with the National Maternity Review, and the Kirkup Report? #MatExp is separate to the National Maternity Review, and the Kirkup Report. We shall certainly make sure our activity and actions connects with this very important work – we see it as another facet. 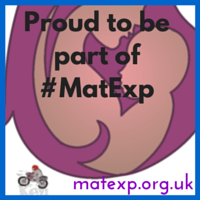 #MatExp is currently run by a team of volunteers, and the project is constantly evolving. We will keep everyone up-to-date with our progress as we are able. #MatExp is fully sponsored by the NHS; NHS England and the London Maternity Strategic Clinical Network funded the initial London pilots. We are in regular contact with key people within the NHS to exchange ideas and updates.